This is an updated version of our original paper Stonehenge Carvings. We discovered some small errors which had been overlooked although I’m sure we read through everything dozens of times. Greetings from Cape Breton. At last I have made the figure 8 back to my blog. Two and a half years ago a gentleman named Lloyd Matthews wrote to me about some carvings he believed were original to the stone monument at Stonehenge. Did I know what they might mean? No, I had no idea that they existed. I haven’t been to Stonehenge, so never had a chance to have a good look at the stones. Like most people who are interested in Stonehenge, I knew about the carvings of the axe heads and the Mycenaean knife but knew nothing about the carvings Mr. Matthews showed me. We have put in all this time researching and spending hundreds of hours with our astronomy programs and reading, reading, reading and watching documentaries about Stonehenge. Part way through our project, James Matthews joined us and made sure everything was correctly written and contributed to some of the diagrams. Great stacks of email have crossed the Atlantic since the start of our project, but now we are finished, happy with the outcome of our research. So now we present it to you , my readers. We hope you will enjoy this paper and I hope that the fact that it is 90 + pages will make up for my two and a half year disappearance. I’m not sure when I will be back but I’ll have something new and interesting. Ancient history is full of interesting things. No, I had no idea that they existed. I haven’t been to Stonehenge, so I’ve never had a chance to have a good look at the stones. Like most people who are interested in Stonehenge, I knew about the carvings of the axe heads and the Mycenaean knife but knew nothing about the carvings Mr. Matthews showed me. We have put in all this time researching and spending hundreds of hours with our astronomy programs and reading, reading, reading and watching documentaries about Stonehenge. Part way through our project, James Matthews joined us and made sure everything was correctly written and contributed to some of the diagrams and the research. Great stacks of email have crossed the Atlantic since the start of our project, but now we are finished, happy with the outcome of our research. Click the link below to read the pdf. So begins Charles Hapgood’s book Maps of the Ancient Sea Kings. 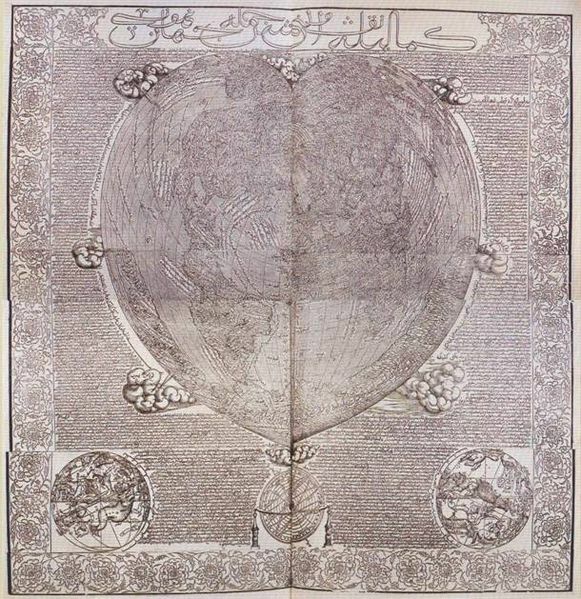 He and his students at Keen State College undertook to analyse the Piri Re’is Map of 1513. Charles Hapgood, his students and several other experts in astronomy, mathematics, history and map making spent seven years analyzing not only the Piri Re’is Map but many other ancient maps also. “The geographer and geologist William Morris once discussed “The Value of Outrages Geological Hypotheses” * His point was that such hypotheses arouse interest, invite attack, and thus serve useful fermentative purposes in advancement of geology. Mr. Hapgood will agree, I am sure, that this book records a mighty proliferation of outrages cartographical and historical hypotheses, as luxuriant as an equatorial vine. His hypotheses will “outrage” the conservative instincts of the historically minded cartographers and cartographically minded historians. But while those in whom conservatism predominates will react to this book like bulls to red rags, those of radical, iconoclastic bent of mind will react like bees to honeysuckle, and the liberals in between will experience a feeling of stimulating bafflement. 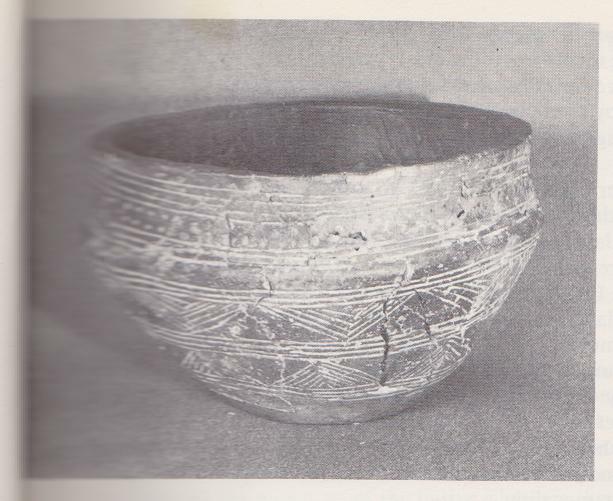 Charles Hapgood, his students and many others connected to this project came to the conclusion that there must have been an older, more scientific culture in ancient times than what we are aware of. One which was well acquainted with astronomy, higher mathematics, surveying and navigation. This doesn’t mean that this culture may have been a high-tech one such as our own, only that there were well educated people who likely did live in a high culture. 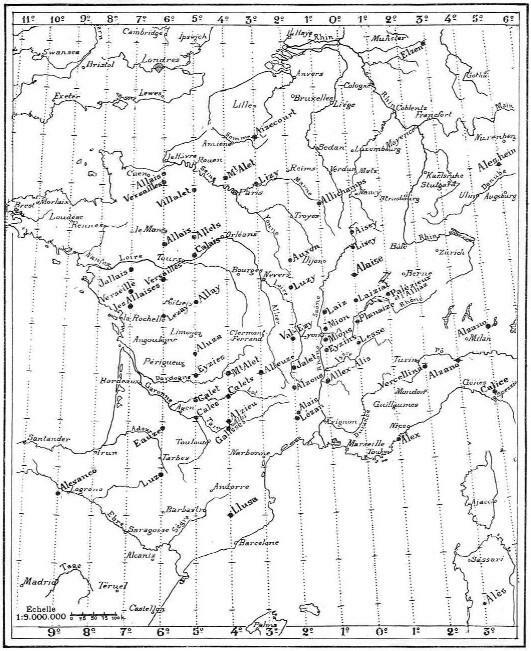 Hapgood explained such maps as the one by Oronteus Finaeus, dating 1531, as a compilation of many small maps which had been gathered together over time. Many of these old maps have details of the interiors of countries which could only have been gathered by people surveying by land. Like all other theories this one is still hotly debated, but as Hapgood says in his book “you find what you look for”. By this he meant that up until his time few people had ever considered that there had been a high civilization with astronomers, mathematicians, surveyors and navigators in ancient times, so ancient that we have no records of them. Of course, some of the records are still there in the ancient sea charts, and in the ancient megalithic constructions on land. But regardless of whether you believe that there was such a civilization or not, there are hard to explain things about some of the maps. 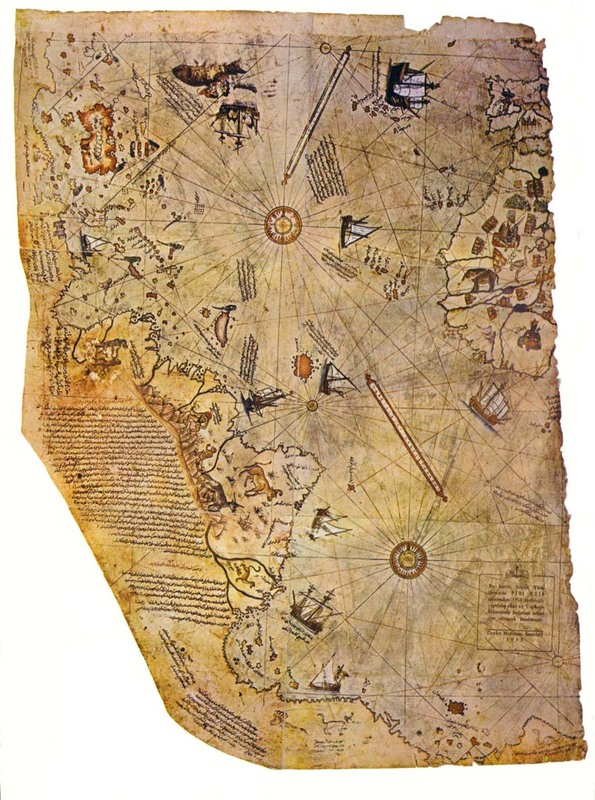 One of the standard maps used in medieval times was the portolan chart. So called because they took mariners from port to port. 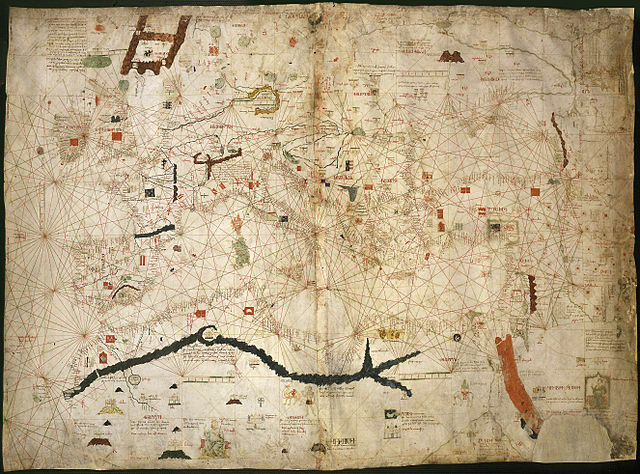 The Dulcert Portolano of 1339 is one such map. These maps usually cover Europe and the lands around the Mediterranean. The longitudes and latitudes seem to be much more correct on the older versions rather than the later ones. The theory being that these maps were copied and recopied by several different people. There were a great many documents and maps destroyed at the library of Alexandria when the contents were burned several times. The old libraries of Carthage and other old cities are also believed to have been destroyed by one group or another during various wars. These libraries housed records about history, literature, mathematics, astronomy, surveying, architecture, medicine, maps and navigation to name but a few things. A great deal of the written word has been lost due to new ideas coming along, some religious, some not. Book burnings still happen, and people still scrap books from libraries if they don’t consider them fit………….according to their way of thinking. What is puzzling about these maps is the longitude. The question being, “How did people in ancient times find longitude?” The chronometer was not invented until the eighteenth century. Before that, longitude was quite a puzzle for many hundreds of years. But long before that, it doesn’t seem to have been a puzzle at all. The people who built the Temple at Stonehenge c2500 BCE knew about it. There’s a line of light there which shows up just before noon. It gradually gets smaller and smaller, until it disappears. It is then apparent noon at Stonehenge, and the line of light sits N/S. A longitude line every day. There are many things on the landscape which show that these people understood longitude. 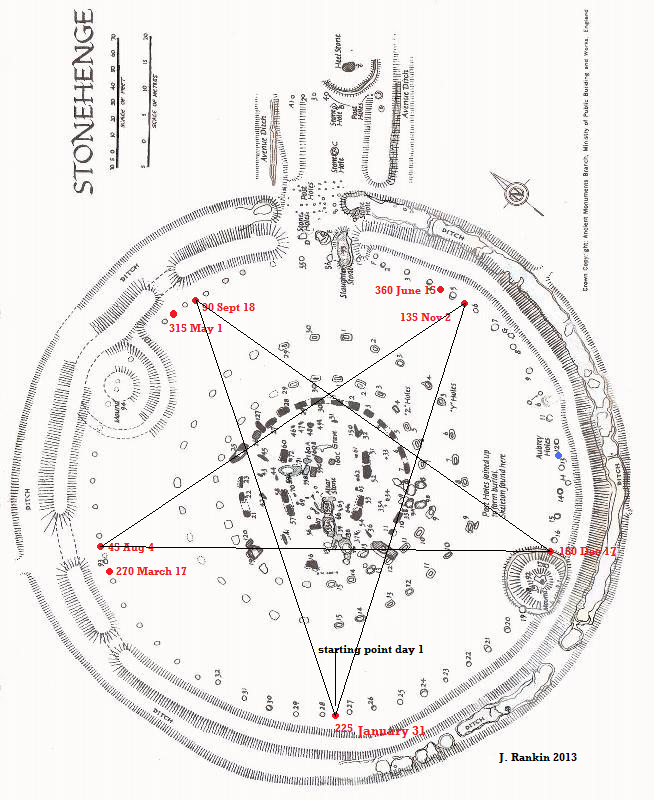 Avebury and Silbury Hill are directly north of Stonehenge. Arbor Low and its egg-shaped recumbent white stone ‘circle’ is 2° north of Stonehenge. Callanish is 5° north and 5° west of Arbor Low. Holy Island is 4° north of Stonehenge. Glastonbury Tor is 1° west of Stonehenge. Oddly enough things do seem to have been placed on the landscape by degrees, both latitude and longitude. The ancients were measuring the globe in 360°. This sort of geodesy is not confined to Great Britain and Ireland, but can be found in many places on the globe. One of the most interesting places is France and some of the surrounding countries. Right about the time Alfred Watkins was hunting old straight tracks in England, a French detective named Xavier Guichard began a personal investigation into the roots of place names in France. 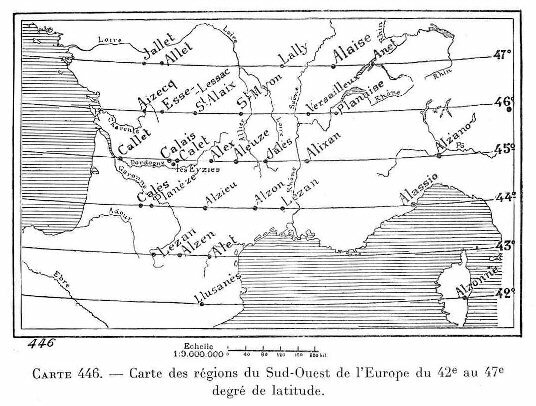 His research led him to conclude that locations with the root-name ‘Alaise’ had once belonged to a network of alignments which extended throughout France, and other areas in Europe, through longitude and latitude. He concluded that he had touched on the Eleusian mysteries of ancient Greece. Unfortunately he and Alfred Watkins didn’t know each other or about their individual searches. Alaise, France is at 47° 00′ N, 5° 58′ E, and Eleusis Greece is at 38° 00′ N, 18° 00′ E. The two sites are separated by 9° latitude and 12° longitude. The independent research is being done by Alex Whitaker of Ancient-Wisdom.co.uk. All the data can be viewed on his site. He has checked mainly primary locations, plus one secondary one. Out of 48 primary places, the latitude for 32 were confirmed correct. The other 16 were not found. However, some place names have changed since Guichard’s day, spellings also. Llussa, Spain is now Lluca. Alex in France is now Aleix, and Leysele, Belgium is now Leisele. Although Mr. Whitaker has only 31 confirmed because he could not find Alzonne on Corsica, I found Ajaccio on Corsica which is at the correct latitude. I think perhaps Guichard made a mistake with the name. Alzonne is a department in France. This is why I have 32 as confirmed. Out of 18 primary places, Mr. Whitaker found 14 correct for longitude. Some of the other locations were not found, and he is still researching this project. The Eleusian Mysteries are thought to have included higher mathematics, astronomy, and geo-metry, which is the measurement of the earth or surveying. It also included Oracles who would have to understand astronomy since ancient oracles were generally astrologers. Guichard’s findings are thought to have been created in prehistoric times, long before there was a country named Greece. A land map that Charles Hapgood looked at was one from China which had been carved in stone in 1137 CE, although it is believed to be a copy of a much older map. He found a copy of this map in Science and Civilization in China by Joseph Needham. By analyzing this map he found the following for latitude and longitude by quadrant of the map. Northwest quadrant, 8 locations, average errors 0.4° Lat. 0.0° Long. Northeast quadrant, 10 locations, average errors 0.0° Lat. 0.0° Long. Southwest quadrant, 9 locations, average errors 1.3° Lat 1.2° Long. Southeast quadrant, 7 locations, average errors 0.0° Lat. 1.2° Long. “Here we have evidence that when this ancient map of China was first drawn, mapmakers had a means of finding longitude as accurately as they found latitude, exactly as was the case with the portolan charts in the West. 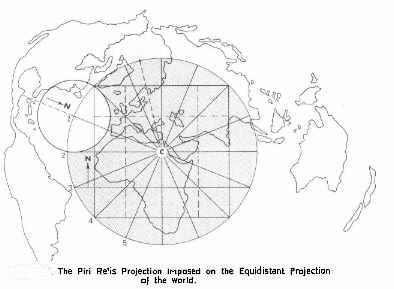 The accuracy of the map suggests the use of spherical trigonometry, and the form of the grid, so like that of the De Canerio Map, suggests that the original projection might have been based on spherical trigonometry. As a further test of the grid I had drawn for this map, I listed separately all the northernmost and southernmost places identified on the map and averaged their errors in latitude. I also listed all the easternmost and westernmost places and averaged their errors in longitude. The average error of latitude north was less than one-half of one degree (or 30 miles! ), and the average error on the south balanced out to zero ( with four localities 1° too far south and four 1.2° too far north). So far as the longitude was concerned, the errors both east and west balance out to zero. There was no indication, therefore, that the grid constructed on the map was seriously in error. Oronteus Finaeus’ map shows Antarctica, partly bare of ice. It shows the coastal mountain ranges and open rivers flowing down to the sea. Geologists have taken core samples from the Ross Sea which suggests that Antarctica had a temperate climate before 6000 years ago. The core samples show that there were several periods of glaciation with times of temperate climate in between. This doesn’t necessarily mean that all of Antarctica was ice free, only that the icecap may have been smaller at such times. Geologists are still puzzled by the cause of Ice Ages, and the last one melted so fast that there really is no conclusion why this was. There are theories, one is Charles Hapgood’s Earth crust displacement theory. He theorised that the Earth’s crust slipped south about 2000 miles due to the enormous weight of the ice covering much of the northern hemisphere. While Europe and North America slipped south, the other side of the globe slipped north. There is another theory which states that the Earth was hit by two meteors, which put things on Earth at a different latitude, and also caused the rapid melting of ice, and a general sloshing about of all water on Earth. This sort of event would also have caused flooding, earthquakes and erupting volcanoes. Some major event does seem to have happened resulting in a great deal of havoc at the end of the last Ice Age with much flooding, earthquakes and volcanoes erupting. The whole story is likely hiding within World mythologies. Antarctica is shown much too large on Oronteus Finaeus’ map. Charles Hapgood felt that this was due to the map having been put together using many smaller maps, and that Oronteus has shown Antarctica in a different scale from other locations. He didn’t adjust the scale to match the rest of the map. On Piri Re’is’ map, Hapgood’s students discovered 900 miles of coast missing in South America. The northern part was good and the southern part was good, but in between there was 900 miles of coast missing. One of the smaller maps had gone missing obviously. No Europeans, as far as we know, explored or mapped the east coast of South America by 1513, but obviously someone did at one time, or Piri Re’is wouldn’t have it on his map. 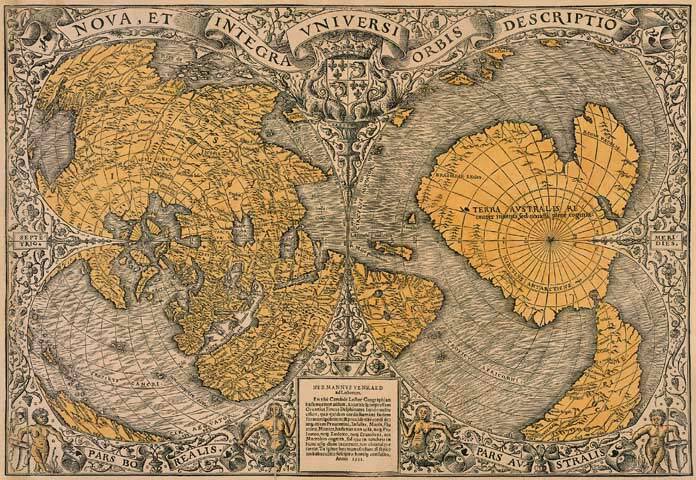 On the Hadji Amhed World Map of 1559, we see all of North America and South America, looking very modern indeed. He even shows the Bering Land Bridge which existed during the last Ice Age. But no one in 1559 knew that there had been an Ice Age or that there had been a land bridge between Alaska and Russia. Nor had any modern explorers been to the west coast of North America to be able to map it. It even shows the Gulf of California and the narrow strip of land south of San Diego. He also shows Antarctica, but also much too big. These old maps which do show Antarctica, all have it too big, and they all have it almost connected to South America. It would seem that all these people must have used the same source maps, but no one adjusted the scale, since no one in their time had even seen Antarctica. Captain Cook was convinced that it existed when he went looking for it. He failed on his first attempt, likely because he was looking too close to South America, and wasn’t far enough south. No one is too sure as to when the original maps may have been made. Derek Cunningham suggests that it was started right after most of the ice had melted. He felt it was sometime between 12,000 BCE and 10,000 BCE. Charles Hapgood felt it had started after the last Ice Age also. If a catastrophe with world wide implications did happen at one time, it is possible that the stars you were used to seeing overhead may no longer have been the same. If there were astronomers, surveyors and navigators at that point in time, they would have to start their astronomical observations from scratch again. If, as the histories and science tell us, there was an enormous amount of flooding after the last Ice Age, things changed, land masses changed. All land masses had their coasts changed. Enormous lakes appeared where no lakes existed before. The Black Sea was once a fresh water lake until the land bridge at the Dardanelles gave way, then it became a salty sea. Coastal towns and villages which may have existed disappeared below the water. There are towns which existed thousands of years ago which archaeologists are just discovering. These places were built well after the Ice Age ended. Most of Doggerland disappeared in 6200 BCE, and Doggerbanks was gone by 5200 BCE. How many people were lost during these events, and where did the survivors go? So far I have not seen a map with either Doggerland or Doggerbanks on it, but perhaps someone removed them from the later maps. “The reader will quite naturally wonder how, if once a great civilization existed over most of the earth, it could disappear leaving no trace except these maps? For an answer to this we must cite one of the best known principles of human psychology: We find what we look for. I do not mean by this that we never find anything by accident. But rather, we usually overlook, neglect, and pass by facts unless we have a motive to notice them. It was Darwin who said that to make new discoveries one had to have a theory ( not a fixed dogmatic theory, of course, but an experimental hypothesis). With the theory of evolution people began to look in new directions, and they found new facts, by the thousands, which supported and verified the theory. The same thing happened a half-century before with the geological theory of Sir Charles Lyell. It happened in the beginning with modern astronomy, when Copernicus proposed a new theory of the solar system. Hitherto people have not seriously believed that an advanced civilization could have preceded the civilizations not known to us. The evidences have been, therefore, neglected. The story begins in Mesopotamia, about 1811, when Caudius Rich began a rediscovery of Babylon. It continued with Paul Emile Botta, Henry Layard, and Henry Rawlinson who brought Assyria back into history. Egypt came back into history after Champollion solved the problem of Egyptian hieroglyphics, and in the fourth quarter of the century, Schliemann brought Troy out of the mists of legend, and Sir Arthur Evans gave substance to the myths of Crete. More recently still an advanced culture, with strangely modern luxuries, that flourished on the banks of the Indus River 5000 years ago has joined the ranks of lost civilizations rediscovered. But is this all? Is the process at an end? Are there no more lost civilizations waiting to be rediscovered? It would be contrary to history itself if this were the case. Unimaginative people made fun of all these discoveries in turn and hounded the discoverers. The same sort of person today accepts all that has been discovered in the past, but denies there is anything more to discover. To date we have not found that civilization, but a great many things have been found since 1966 when Charles Hapgood wrote those words. Among them are Gobekli Tepe in Turkey, the houses at Durrington Walls in England, and most of what is being found in the Orkneys. Gobekli Tepe is one of the big puzzles because of all the carved stone which has been found there, and the fact that people do seem to have buried the place completely for some unknown reason. It is being dated c9000 BCE, and such stone carving doesn’t show up again until thousands of years later.This seems rather odd, and one would expect more of it to turn up sooner or later. 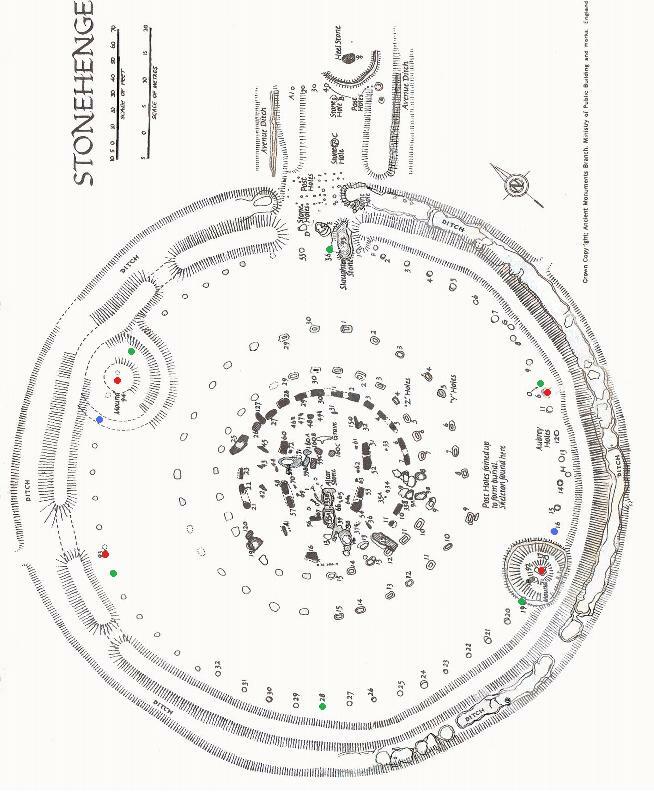 Durrington Walls is part of the Stonehenge Complex. It includes Windmill Hill, Avebury Ring, Silbury Hill, the Sanctuary, Woodhenge, the West Kennet Long Barrow, the Cursus, Durrington Walls, Bluestonehenge and Stonehenge. And whatever may be lying in hiding at the moment. Martin Doutré of Ancient Celtic New Zealand theorizes that this complex was an ancient navigational school. He feels that the Boyne Valley Complex in Ireland and the Ness Brodgar Complex in Orkney were also navigational schools. His mathematics on the subject are very convincing. However, I find this view somewhat narrow. Since navigation has its roots in astronomy it is quite likely that astronomy, surveying and map making were taught also. Oracles were very popular at the time, but ancient oracles were usually astrologers hence they had to learn astronomy first before proceeding on with their chosen profession. If you wanted to run a calendar circle in your area, you would first have to learn astronomy. The houses at Durrington Walls are believed to have been only seasonal accommodations because no querns or carbonized grain was found within them. But like Skara Brae, all the cooking and baking may have been done at one central kitchen, which may not have been found as yet. I did find a very interesting Grooved Ware bowl from Durrington Walls c2500 BCE which may have been a latitude memory device. The parallel lines running around this bowl are lines of latitude. Starting at the top the lines are 65°N Iceland, 60°N Shetland, 55°N Holy Island and Bornholm Island which is also at 15°E, 50°N the tip of Cornwall. The space between these and the next group of three lines is 15°. The three lines are 35°N Morocco, Algeria, Tunisia, Crete and Cyprus, 30°N Giza, 25°N the Dakhleh Oasis where the stone circle at Nabta Playa is. The next space is 20°. The next group of lines are 5°N which runs along the south coast of north-western Africa, the Equator, 5°S Lake Victoria. The next space down is 20°. The next group of lines are 25°S, 30°S, 35°S and 40°S. 25°S and 30°S run through Australia, 35°S runs through the passage between Australia and Tasmania, 40°S runs through New Zealand. The next space is 15°. The last four lines are 55°S the tip of South America, 60°S South Orkney Island, 65°S runs through the long narrow tail of Antarctica, 70°S Antarctica. If this was a memory device, it only took me a few minutes to remember. If it was in front of your nose every day, you’d remember. And obviously they were interested in more that just the Northern Hemisphere, they even included Antarctica. There are likely many more interesting places along these latitudes, but think these are quite good. Have a look at some maps yourself, and see what other interesting things can be found at these latitudes. Xavier Guichard, Eleusis Alesia: Enquête sur le origines de la civilisation européenne, 1936, detective, archaeologist and writer. Since it has been raining here for several days, I’ve had some spare time to assemble the pictures I wanted to use for this post. 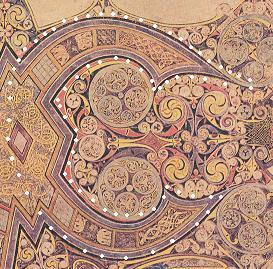 I’ve taken an interest in Celtic art for some time, I always found it intriguing. After some time, I realized that there were heads and faces in many of the designs. 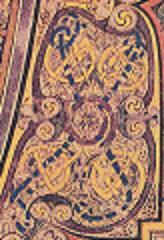 Not only the ones which are obvious but others as well, often made up of triskles or other swirling designs. The theme of double heads is seen often. Sometimes it’s one head, but if you turn it over, it becomes a different head. Sometimes it’s two men. Sometimes a man and a woman. The two men are the Summer and Winter lords, the man and woman the goddess and her consort. 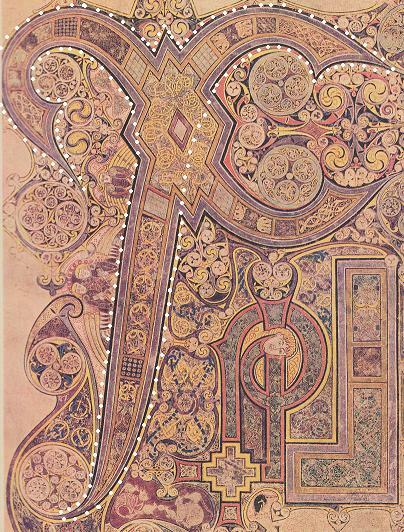 At the very end of a Celtic art book named Celtic Art by Ruth and Vincent Megaw, there is a picture of the Chi Rho or XPI page in the Book of Kells, and I wondered if Lugh/Cernunnos, or Summer lord -Winter lord had made it to the monasteries. 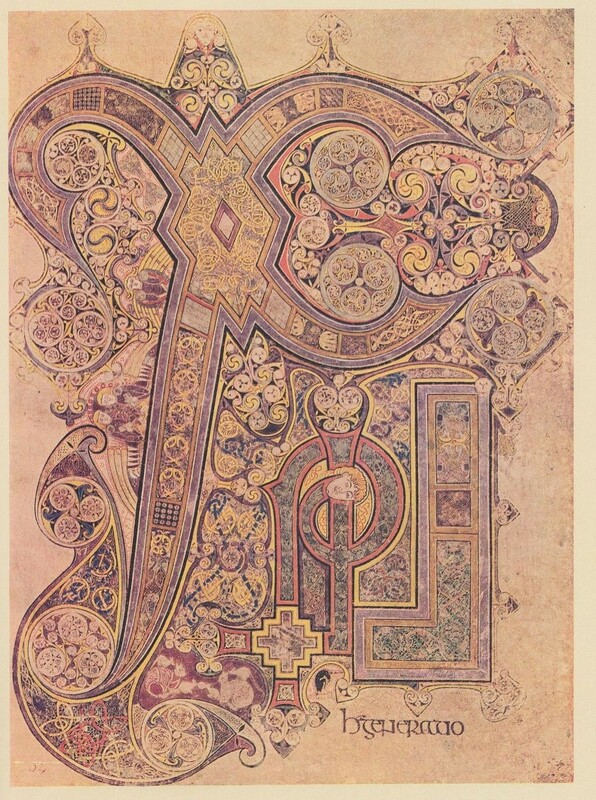 I have a colour copy in a book named The Book of Kells, text by Sir Edward Sullivan. A reproduction of the 1920 version. However, I found a clearer picture on-line. 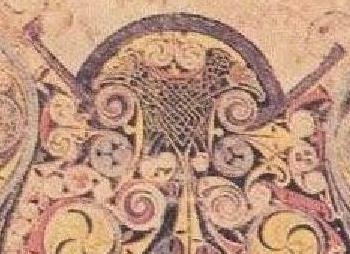 This book has been connected to St. Columba, but it has never been proved. 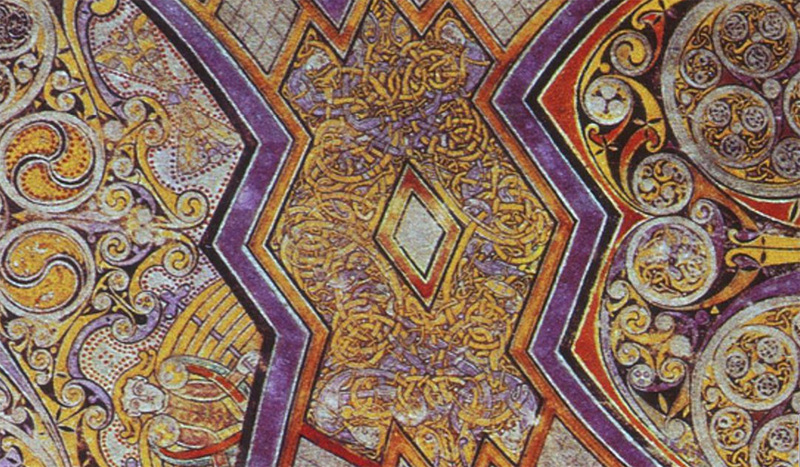 He is said to have worked in a scriptorium in a monastery in Ireland, and that there was a dispute about a manuscript Columba borrowed and copied. Apparently hostilities broke out and several people were killed, resulting in Columba’s exile to Iona. 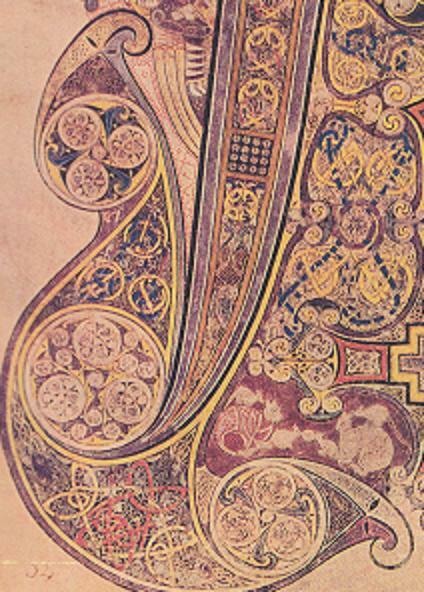 However, the experts say this book dates about 800 CE, and St. Columba died in 597 CE. I don’t know who created this page, but he knew Ogham and all its meanings, and I think he may have left us a picture of a real Druid. St. Columba was from the Druid tradition, that’s why he is called a Crane Cleric. The crane being Cygnus, and connected to Manannan and his Crane Bag in which he kept his treasures. The treasures being the Ogham tract, including the vowels, consonants and diphthongs, plus the rolled up strip of the Whale’s back. The beginning of Columba’s name is Col. Coll is the Hazel, the Hazels of Wisdom. The early Church in the UK and Ireland was the Culdee Church. It believed in God, Jesus, Mary, John the Baptist, and followed the Apostles. At the same time they still kept to their old Druid traditions. Most of the men and women connected to the early Culdee Church came from Druid backgrounds, and were already educated in their own traditions before entering a hermitage or monastery. These monasteries had both men and women, and both could become scholars. There was equal rights among them, they could even marry and have children. The earliest Christian writings in the Culdee Church were on Ogham sticks using Ogham, and later on velum and written in Greek. The Druids used Greek also, and Iona was once a Druid mystics’ retreat. No one has ever disputed that this is the most marvelous page. Everyone is taken by the knot work, triskles, circles, etc. but no one has ever described the following, as far as I know, because no one knew that it was there. I have seen many of the formations before, but didn’t know their significance until now. According to the art book, this page is supposed to say XP, the first two letters of the Greek word Christos. But this artist actually has spelled the word Christos and quite a bit more. 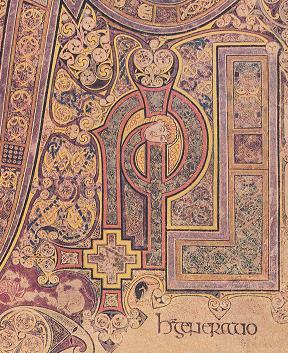 According to my Book of Kells, it says XPI, short for the Latin Christes. But this artist used Greek, he used it on another page also. The Druids spoke Greek long before Latin ever came to the British Isles, and I’d say this person came from the Druid tradition even if it was in 800 CE. 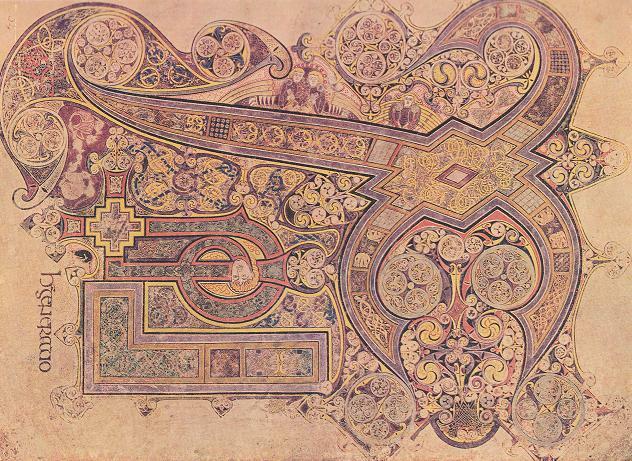 The basic layout for this page is similar to the XPI page from the Lindisfarne Gospels. We have the big X looking very bird-like, which is meant to be Cygnus, The Swan. Two arms of the X become a turban on an astronomer/astrologer or Druid. I say astronomer and astrologer because he is wearing the propheta head-gear. 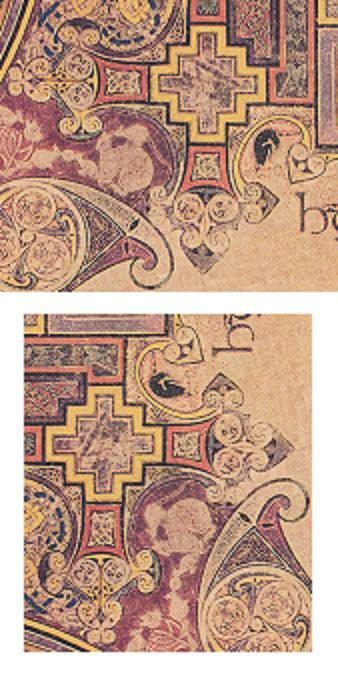 (1) On this page the legs of the bird are a straight staff joined to a staff with a curl in it, and a shape like a backward L. Both pages are very beautiful, but the one from Kells has a great deal more detail, and the hidden Ogham, which the one from Lindisfarne doesn’t have, although it does have small hidden pictures. The first thing you notice on this page is the big X. It has the lozenge or diamond of the ‘hidden secret’ symbol in the centre of it. The angles of the smallest lozenge or diamond are 60° and 120°. Two equilateral triangles back to back. 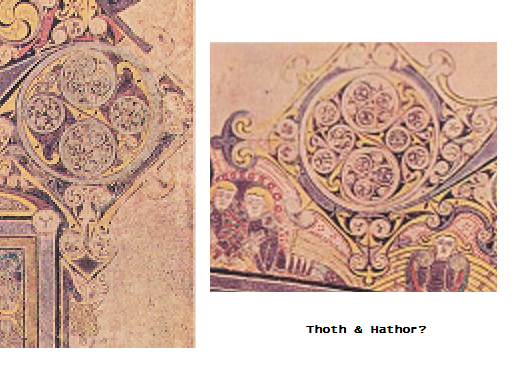 I call this the Double Godhead, because of all the double faces in Celtic art which are usually, but not always, two men. These are the Summer lord and the Winter lord, the two halves of the year, the dark half and the light half. In fact, the artist has gone out of his way to embellish this lozenge with knot work and four men entangled in the knotwork. They represent the four major divisions of the year, the Equinoxes and the Solstices. The whole thing becomes a much bigger diamond shape. Some time ago I discovered that the number four is connected to this shape and the ‘hidden secret’. Here as well. The artist has hidden four letters in the X and has applied Ogham meanings to them. The letters are C, H Ss, and T. Ss because he has used it twice to spell Christos, but it has meaning in Ogham as well. The statement, which St. Columba is said to have made about Jesus being his Druid becomes even clearer on this page. The C is the first letter in Christos but is also the ‘turban’ on what I have been calling a Druid. The C is the two right arms of the X. C is for Coll, the Hazel, the Hazels of Wisdom which is another way of saying Druid knowledge. Jesus is said to have studied with the priests in Egypt. When he was only young, he was debating with the rabbis at Temple. Well educated even by then, and he was a great orator. The H is right in the middle of the big X, and is comprised of the diamond and part of the four legs of the X. Right up to where the dark squares with the flowers in them are on the two left legs, but not including them. The flowers are wild Asters in the dark squares, it represents the time after September 21, the start of the dark half of the year. On the long leg of the big X, the light grey square is April, and the rings are May, June, July, August and September. In this case the dark square with the Asters is October, the next ring down is November and the point is December. Church tradition has Jesus born in December. 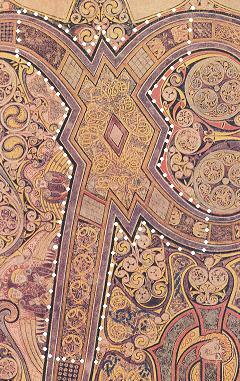 The centre diamond is January, the darker border around it is February, and the part with the gold knot work is March. The H is for Huathe, the Hawthorn. Its month is April, and that is when Easter usually falls. It is also the month which starts the light half of the year after the Spring Equinox. The first festival in the light half of the year is May 1, when we get Maypoles traditionally decorated with Hawthorn flowers. Garlands were also made with these to decorate the houses. Joseph of Arimathea planted a Hawthorn staff at Glastonbury Tor, it grew and flowered. This letter is connected with a period of waiting, restraint and chastity. Jesus spent forty days in the wilderness before his last visit to Jerusalem. The Ss is an S used twice. The top part starts on the left hand top part of the X, moves through the diamond and ends with the bottom part of the C. Ss is for Straif, the Blackthorn. The English word, strife, comes from this. It has to do with overcoming great odds with optimism, bringing balance out of chaos…………………much can be said about this in connection with Jesus. You can fill in all your own blanks, since this topic could go on for pages. The T is the top of the S, the top of the C and the long leg heading for the bottom left hand side of the page. T is for Tinne, the Holly, which became the Holy Tree because people associated the Holly leaves with the Crown of Thorns. But that isn’t correct. It is the Holy Tree because the cross Christ was nailed to was T-shaped. The Roman’s used a T-shaped device for crucifixion, not the Christian cross we see now. This monk knew that. Holly is said to be best in the fight, not only spiritual but because spear shafts were made from Holly, and the most important thing about throwing a spear is balance. So it also speaks of equilibrium, and the spear which pierced Christ’s side, but it also speaks of all the other spear imaging we see with Lugh, Wodin and many other Sun gods. Holly is also a symbol of fertility, and here the long point of the T is placing an egg on the Mound of Creation which, as in the book from Lindisfarne, has the head of an ibis. This is that wee story: Thoth as the Ibis laid an egg on the Mound of Creation, which was Hathor as the Milky Way. From the egg, Ra, the Sun god was born. Thoth as the Ibis is Cygnus, which sits on the Milky Way. The O, I and R are at the bottom of the page. What is usually referred to as P is actually a glyph, making up P (for the casual observer), R and O. 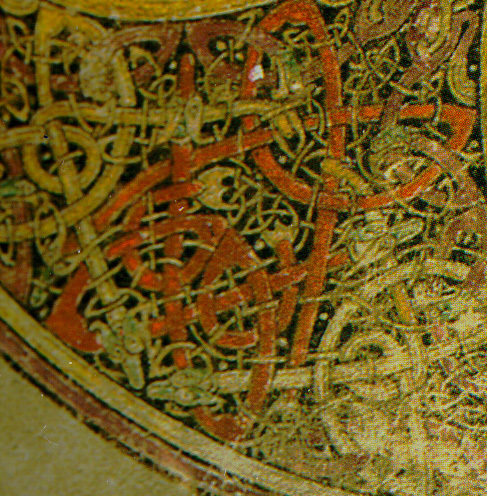 In very old manuscripts P was often written more like a B. But the monk has used a wake up device here to alert you to the hidden depths. Not only do the letters O, I, R belong to the word Christos, but it is also the name of an Ogham letter, Oir or the Spindle tree, whose symbol in the Ogham tract is a square with its corners turned to the cardinal points. I call this the Square of Enlightenment. The O is shaped like a stepped square and is holding together the two legs of the R, showing that these two belong together. The I is the shape which looks like a backward L.
For O he has used Oir, the Spindle. It is connected to that sudden flash of insight and lightning. In fact, it was the clue to this glyph. He has made it stepped and yellow, suggestive of lightning. This is also the shape of the Andean Cross which is symbolic of the Southern Cross. This constellation was used by mariners, as was the Northern Cross which is Cygnus. Spindle wood was made into spindles, bobbins and pegs. In this picture he has pegged the two legs of the R together with it. A joiner or carpenter, which is what Jesus was. He is also connected to enlightenment. Although Jesus was not born on December 25, we celebrate his birth at this time of year because people continued to celebrate this time of the year. In England it was referred to as Yule, and it was to welcome the Holly Lord, who long ago was Cernunnos. We still refer to this time of year as The Coming of the Light. Today it has a multi-layered meaning which comes to us from the time when people first took note of this return of longer days. A tradition which has endured over many thousands of years. The R is made up of two elements, but the monk has shown us that they belong together by joining them at the bottom with Oir. 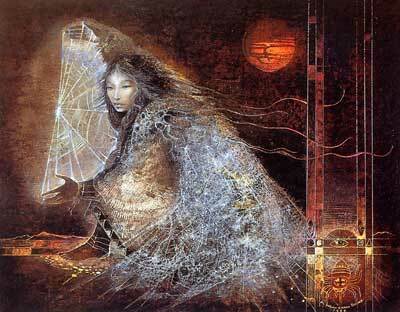 R is Ruis, the Elder, the end in the beginning and the beginning in the end, the Cauldron of Immortality. The two elements which make up the R are what looks like a P and an I. The P is Phagos, the Hook, old knowledge, old writing, and also a star watching – surveying instrument. The I is the measuring rod and is also a Rodman or Dodman. If both of these were astronomy and surveying devices, then it speaks of the Star of Bethlehem also. The measuring rod is straight until it gets to the top where it becomes more circular in the space between the bottom of C and the top of P. There’s a face there made up of circles and triskles. He uses them in all his half hidden meanings. The head seems to be covered by a hood, and from the top of it there are two long antennas with balls on the ends. 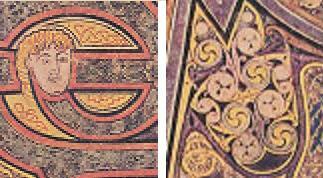 The right one sits over the I, and the left one becomes part of a torque sitting under the chin of another face made of more circles and triskles and bird shapes. This face is Cernunnos. He has two horns on his head, and Cernunnos was often shown wearing a torque. I’ll come back to him, but first look at the I which looks like a backward L.
The I is Ioho, the Yew, which stands for rebirth, everlasting and reincarnation. According to my Ogham book, the Island of Iona first started off as Ioho or Ioha, but that there was an error in transcription made in the fifth century, and it became Iona instead. This island is connected to reincarnation. Jesus is the new Cauldron of Immortality, symbolized by the Holy Grail, and he is connected to rebirth and everlasting. The early Church still believed in reincarnation, but I don’t think they do anymore. The, I, the monk has made is shaped like a carpenter’s square. 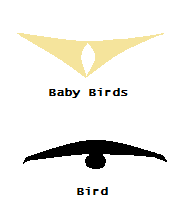 Below are examples of two types of bird shapes this monk used in his decorations. The monk also has many things made up of circles, triskles and other bird shapes, one of those things is ibis heads. On Thoth, it has the long curved bill. There is one under the top curve of the S. There’s a big ibis head close to the two angels, there’s wonderful knotwork inside of the head.. She has her beak curved around a circle, which I’ll call an egg, which has three small flying cranes inside it. There is another ibis head close to the bottom of T, it’s sort of lying down. It also has its beak around an egg containing more small cranes. The two eggs they are holding have cranes at a different stage of development inside them. I say cranes because the bill is straight and long. These two heads are part of the Mound of Creation where there is another egg being deposited by the wingtip of Cygnus. This egg has yellow birds which are hardly developed and there is much more white in the egg. Here is that story about Ra again. Thoth as the Ibis (Cygnus) laid an egg on the Mound of Creation which was Hathor as the Milky Way. Ra, the Sun god, was born of that egg. 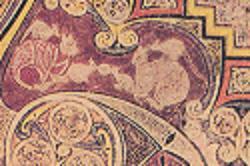 In the bottom left hand corner detail we see a baby (red serpents) emerging from the womb (white serpents). This would be Jesus who the Church says was born at the end of December. The point of the letter T is the end of December. The fat cats and the little rats seem quite cozy together. They’re the abbots and the monks who fell in line with them. They are nibbling on the Pearl of Wisdom, the knowledge they were gaining in the monastery. No doubt, a wee Celtic joke on this artist’s part. The corner detail of this page also implies that two ibis hatched new cranes together. They are also inside some of the other circles, and in some cases there is what looks like a bird flying toward or away from you. On the left, Cernunnos has two cranes close to the top of his head, they make a sort of crown. There are two more on his cheekbones. He has two flying birds making up his nose, and two more holding the plumes of his headdress. Some of these flying birds are light like the crane and some are dark like the raven. There are also heads of cattle there, also made up of circles, triskles and flying birds. One is between the angels. There are two more there making up the corners of the decoration around a circle with more cranes or ibis inside it. Unfortunately the outside one was cut off below the eyes. The one on the left is hanging off the Druids earring, close to the top of the I. This could be Taurus, or a connection to Bull El/ El Elyon, who was the god Enlil of the Sumerians. Elion is a Welsh name for God, it is still in the dictionary, although I’m told that it is seldom used. It was Enlil who taught people to farm, he put them to work in the Garden of Eden. At one time, the oldest cult figures found were small stone bulls from Mureybet, home of Jasmine, whose descendents made their way to the UK and Ireland, and were found at Skara Brae in the Orkneys. As far as I know, Mureybet still stands as the oldest farming community anywhere. The two cattle above could also be symbolic of Thoth and Hathor, both are shown with cattle horns, and both often have the Moon above their heads. Bulls, male goats, rams and harts or roebuck are all connected to ancient Sun gods. There was a great deal of cattle veneration in ancient times, from the Indus Valley to Ireland. Cattle are still sacred in India, and Celts loved owning large herds of cattle, which they often stole off one another. The Wessex lords are also believed to have been cattle barons, and my guess is that the folks at Ness Brodgar were also. There were a great many cattle bones found there. I think the artist may have cartoonish representations of Bran and Branwen. They are the Raven and the White/ female Raven. He is at the bottom of Phagos, the Hook – old knowledge, old writing. She is at the bottom of the measuring rod which could also be a surveying staff. They both look as if they are wearing a red hat with white knot work. I hesitate to say Fez, but they do look like that. She has blonde curly hair, has two trinity knots on her face, and a light coloured bird on her forehead. She also has a baby bird close to her curls on one side of her head. This would be Gwern, her son. The baby bird is two triskles joined at two corners. 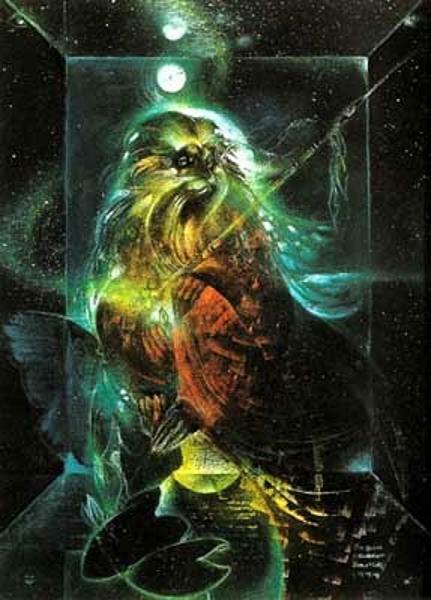 Lugh, Apollo and Wodin were also connected to ravens. I read that the small animal above Bran’s head is meant to be a badger with a fish. The fish is symbolic of Christianity, and Jesus was a ‘fisher of men’. But Bran, who is much older, is believed to be the Fisher King. Like the Fisher King, Bran was wounded in a lower limb, a wound which never healed, since it brought about his death. The X symbol for the sacred place is in the knot work between the leg of T and the R. The big X makes the whole page the sacred place, but the area in which the blue X is, looks like the Station Stone quadrangle at Stonehenge, including the Temple in the middle, and the Station Stones at the ends of the X. There are three ibis above one of the Druid’s eyes. The red band below his turban looks like an M when he is facing you, but looks like an E when the page is right side up. 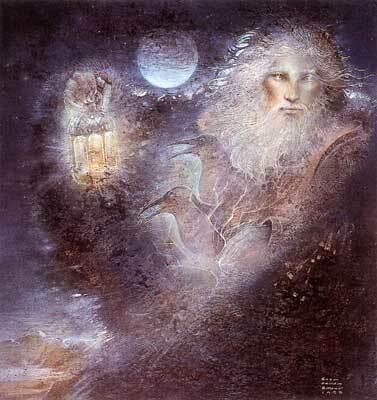 The artist could be suggesting that this is Manannan since the M shows up when he is facing you, but this is also the MEW3 device as you turn the page around. This device is symbolic of the four divisions of the year and also the four cardinal directions. The headdress of the Druid is made of the letter C, Coll, the Hazel, the Hazels of Wisdom, that’s why I think he is a Druid. I think what he has on his head is a sort of turban with long tails flying behind, but they give the same impression as the headgear on the Hittite hieroglyph for propheta. (1) A prophet in ancient times was usually an astrologer, hence an astronomer. Perhaps it was only a long piece of cloth, which is what most turbans are made up of. In this case it is embellished with the big diamond. The ‘breast plate’ found in the Bush Barrow (2) measures 71/2″ by 6 1/2″ according to Prehistoric England, but I’ve also seen 7″ by 6″. If you tied a scarf around your head and connected it with the gold ‘breast plate’, you would pretty much look like this Druid. You’ll have to add a beard, moustache and large round earrings, and don’t forget the braided effect in the beard. The monk is there as well, above the Druid’s head. The end of the S is over his head, looking somewhat like the cowl on a monk’s habit, particularly if you put your fingers over the area I have painted in. He has a moustache and a little curly beard which is divided in two at the bottom. There are baby birds close along the edge of his hood. Sheltering Druid children up in Iona? His eyes are very prominent and he has used Bardic values here. The left eye has two which is duality and polarity, as above so below, which puts us back with astronomy and the calendar, but also has all sorts of esoteric meanings connected to it. Duality because he was mixing two separate traditions. This person was as much a Druid as a Christian monk. His right eye is the Trinity. Past, present and future, or chaos, balance and creative energy. Or Creator, Sky Father, Earth Mother. Or Kether, Chokma and Binah. Or Father, Son and Holy Ghost. Or all of those depending on his education. The egg is his brain or mind, it includes the crane. It’s difficult to see what is in the circles, but the large one and the small one seem to have the same design as the two on the Druid’s forehead. The ibis is there making up the back of his skull and has an Ogham, the three short yellow lines. It says Holly, best in the fight, but he has it on the ibis, so he thinks his Druid knowledge is best in the fight. Or possibly he is referring to astronomy and Cygnus. Since the ibis is the back of his skull, perhaps he is saying it is bred in his bones. The S in this case was Ss for Straif, overcoming great odds with optimism, making balance out of chaos. Certainly sounds like St. Columba, I’m not surprised that he got on so well with the people up in Iona. Iona was a Druid mystic’s retreat long before Christianity. The artist has used and shown the last five letters of the Ogham tract or Forfeda, among others. The two parallel lines crossing two parallel lines with the lozenge or diamond in the middle, which I call the hidden secret. The Hook, the X or sacred place, Oir is the square with its corners turned to the cardinal points, and the Net which is in the light grey squares which are part of the big X and represented April. It is connected to the Sea, the Moon and maternal connections. The symbol for the Net is usually three squares by three squares, although I have seen two by two, three by three and four by four. This monk used four by four, and if you put these four light grey squares together you get a square of eight units by eight units, a Square of Hermes. However, a four by four square can be created with the sixteen wind system as shown below. (3) (4) This was used to create mariners maps. The number four was sacred to Hermes. An eight by eight square gives you 64 small squares. 64 ÷ 4 = 16, that Mystery School number. Knot work comes from Cording Lore which probably goes back to a time when people first had cording of some kind. Probably some bored soul on a rainy day with nothing better to do but make fancy patterns with his or her cording. Most of the patterns have names and meanings. On the XPI page the cording is gold inside the big diamond, it’s the measuring cord or Whale’s Back which is the line all the Ogham symbols sit on. He also has the measuring rod or surveying rod, the Hook which was a surveying or star watching device, a carpenter’s square, and the dividers which sit on the Druid’s nose and are made up by the beaks of the ibis. When you turn the Druid upside down, the woven part of the beard now becomes a little man with big eyes, and he seems to have something long coming from the top of his head. Lugh- Cernunnos again. His head and arms rest on the curve. His ‘arms’ are actually two animal heads, one is a bird but I’m not sure of the other. Could be something doggie. Can’t see the detail well enough, but the whole thing does look like the Trilithon Horseshoe at Stonehenge. I can’t see some of the smaller detail either, so he may have more messaging in that. However, I can see that some of the interlacing is made up of snakes, usually in pairs, and there are snails there also. Some are on the Druid’s face…….. think abstract. One of the more interesting snake configurations is at the bottom left hand corner. Two light coloured snakes and two red snakes both make a lozenge or diamond formation. Symbolic of the white and red serpent lines? If this is Jesus being born, then he would be of the red serpent line, or the Rose Line as it is sometimes referred to. Oddly enough, so were the Druids. The red dragon of Wales is still symbolic of the red serpent line. The history of these two family lines comes from very ancient times and are connected to Ea/Enki and El/Enlil. Some of the elements of these manuscript pages, such as the humans, were considered rather childish, and everyone is still scratching their heads about the figure of St. John with hands for feet. (6) It takes a different way of seeing, and since most folk are so busy looking at the triskles, spirals and interlacing………..they don’t ‘see’. They can’t see the forest for the trees, and considering what is on this page, that’s incredibly funny. This is the most sophisticated use of Ogham that I have found so far, and likely there is more messaging in the smaller detail, it’s just too small for my eyes. A few days with the real page would likely clear that up, although it is not likely I’ll ever get to see it. I wish! Most art lovers drool over this page, and most of them probably couldn’t put into words why they feel this way. Oh sure, we can all wax lyrical about the triskles, spirals and interlacing, but there is so much more there that we recognize somewhere deep inside us, subconsciously. Something our DNA recognizes, but out modern way of thinking has buried it for a long time. It’s interesting to note that the knot work in the Druid’s beard makes the same formation as the Wessex lord’s ‘breast plate’ which has been dated c1900-1600 BCE. It was in a grave for at least two thousand years before this page was made. If you were to extend the net on the ‘breast plate’ it would give you the same formation in the Druid’s beard. The Wessex lord’s large gold lozenge may actually be a real Stonehenge artefact. The logo, if you like. And I think that originally came from the surveying for the Aubrey Holes. (7) I think that Julius Caesar may have had it correct, the Druids started in the UK and Ireland. When I started down the White Trail, I was not looking for Celts and their Druids, but ran into them just the same. The Wessex lord, from the Bush Barrow, with his interesting mace head was likely the Archdruid of his time, after all, his mace head is the original Druid’s Egg. Did he wear his gold lozenge on top of his turbaned head? A forerunner of the gold hats? 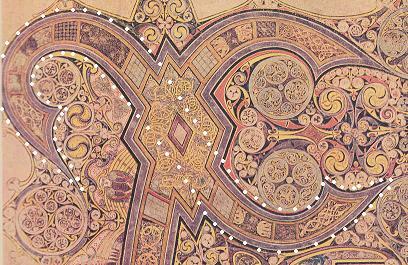 In my article Cygnus, Thoth, XPI and the Brodgar Complex, I showed how this page and the XPI page from Lindisfarne Gospels connected to the Orkneys with its ancient astronomers, surveyors and navigators. Both Iona and Holy Island or Lindisfarne are sites belonging to the Cygnus that Derek Cunningham found on the landscape of Scotland. These two pages are a record of that ancient surveying, and tell us that it was the Orkneys which became the Mound of Creation. The place where astronomers, surveyors and navigators existed in ancient times. Navigators because on the page from the Book of Kells, we find both Cygnus and the Southern Cross, both these constellations were used for navigation. What is really amazing is that all the ancient constructions on the Orkneys were created about three to four thousand years before these pages were made. If Derek Cunningham is correct with his dates for Cygnus being placed on the landscape of Scotland, then that was eight to ten thousand years before these pages were made. It’s obvious that there were still people connected to the early Church who knew about this history. And what about the Summer lord and Winter lord? which is what made me look at this page in the first place. They are there also. Lugh and Cernunnos. Mapping device from Ancient-wisdom.co.uk. This was originally in Charles Hapgood’s book Maps of the Ancient Sea Kings. Today I found myself firmly planted in the present as I was standing in my garden on a golden August afternoon, contemplating all the work which needs to be done. I live in a small house, in a small grove, surrounded by woodland and nature in general. The wildlife includes black bears, moose, deer, foxes, bobcats, lynx, coyote, raccoons, beaver, otters, muskrats, and the ever present squirrels, chipmunks, mice, voles, frogs, toads, salamanders and snakes. The air is full of birds small and large, including bald eagles, osprey, hawks, ravens, crows, herons and the wee comedians, the hummingbirds. 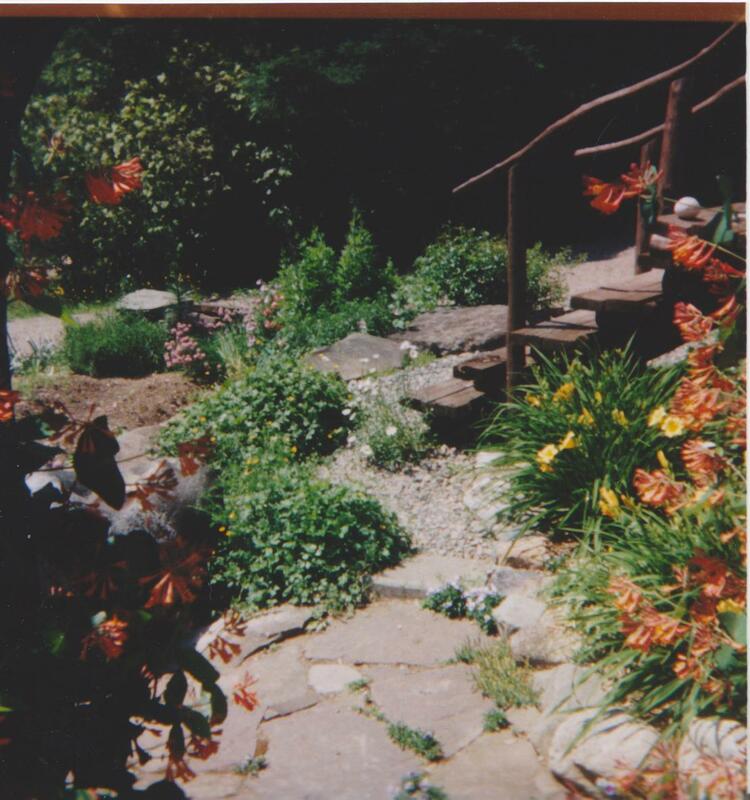 The small grove is filled with shrubs, flower beds, vegetable plots, gravel paths and bits of lawn. Around the edges can be found patches of wild strawberries, raspberries and blackberries. Although it was still a beautiful summer day, the quality of the light has changed. The sun no longer rides as high in the sky, and the shadows are lengthening. Soon it will be fall, and the maple tree behind the house will flood the back porch each morning with its lovely orangey red colour. The countryside, with its valleys and hills, will look glorious then. 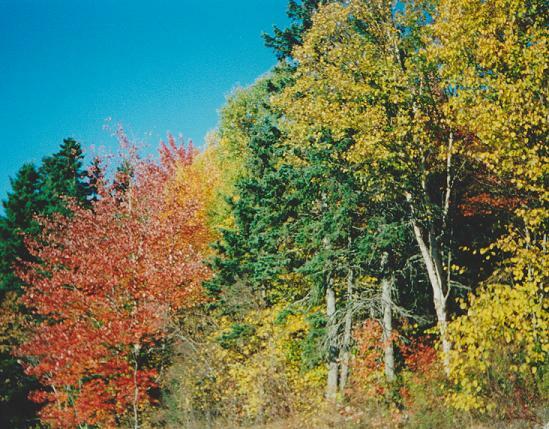 The fields, like pieces of green velvet, will be surrounded with red, orange, gold and russet trees, shrubs, and bracken. 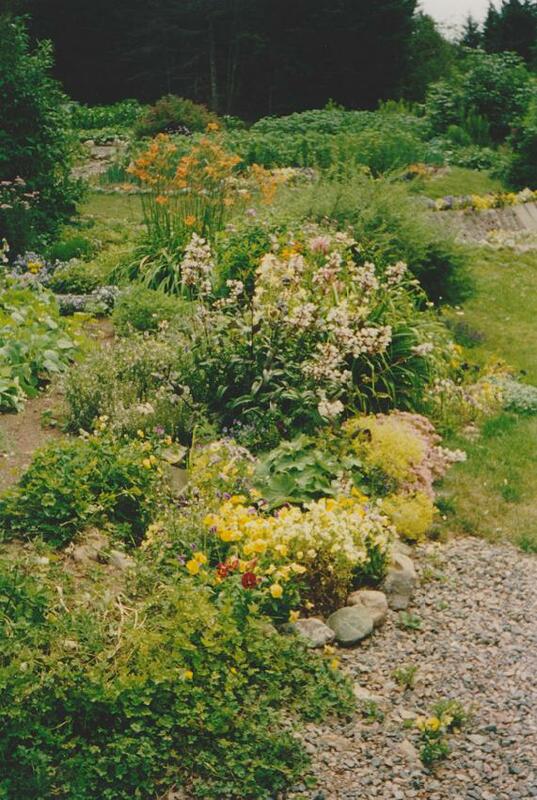 But soon enough the rains and high winds will blow the leaves in great drifts in every nook and cranny of the garden. This is a very busy time for me. A time of gathering. A time to pick the vegetables and berries, and process them for winter, which generally means much blanching of vegetables, jam, jelly and pickle making. Apples will be picked and sliced, and stored in the freezer to make pies and apples sauce during the winter. The gardens must all be cleaned up before the snow comes, and there is still a pile of fire wood to be put under cover, so I won’t freeze during the cold months ahead. 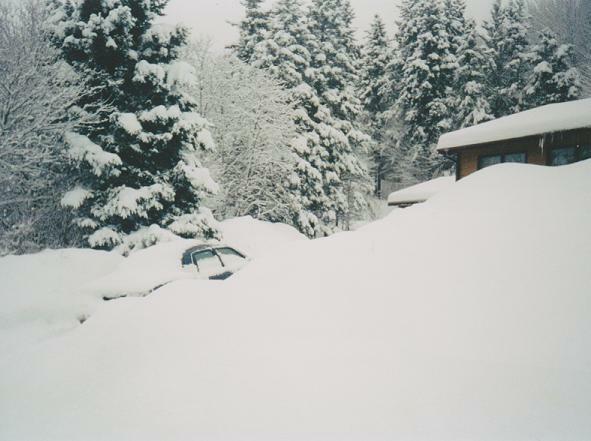 Perhaps it seems odd to be thinking about winter at the end of August, but when it comes, it can come with a vengeance. Then I’ll be staying cozy and warm by the wood stove, reading books and using my computer. Then I’ll be sticking close to home and digging into ancient history once again, but for the moment I must attend to my chores for a while, so I hope that you will understand that I will not be posting anything new for a bit, because it will be work, work, work from morning till night. By the end of the day I’m usually just too tired to concentrate on ancient history, or anything else for that matter. 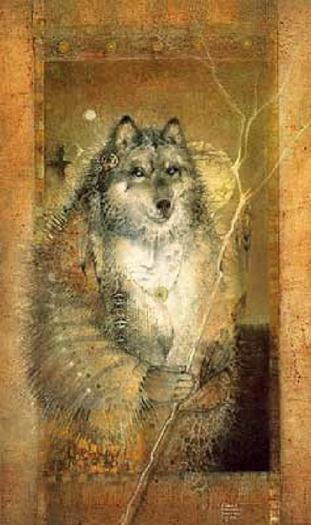 Grandfather Wolf has struck me in the head with his lightning stick today. Wake up old girl! You’ve made an error in the calendar at Stonehenge. I am posting it here so that anyone who has already seen it will know about this error and correction. I’ll also edit my original post, so that it will be corrected. 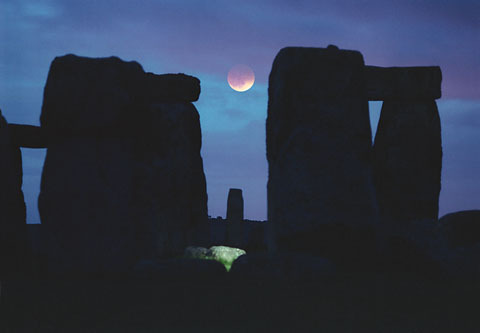 This means that at Stonehenge, leap year was missed every 128 years. Instead of adding two days, as I said in my original piece, you would add no days at all. So that cycle of 72 and 128 years still stands except for this one detail. It also means that the people at Stonehenge were keeping a more accurate calendar than either the Egyptians or the Sumerians in 3154 BCE. What makes me think this is correct, is the way the Aubrey hole circle is set up. The red dots are the Station stones. They were not used to count with, only the Aubrey holes and the spaces in between. The days were counted counter clock wise on the spaces, the years counted clockwise on the Aubrey holes. The green dots are the 10, 9, 9 year counts connected to the eclipses. Counting from Aubrey hole 1, all the way around the circle and on to Aubrey hole 16, will give 72 years. If you count around the circle again and back to 16, you have counted 128 years. 72 + 56 = 128 The second cycle of 72 and 128 years, starts at Aubrey hole 29 and ends at 44 for 72 years. Go around once more, and you have 128 years. Aubrey holes 16 and 44 are marked by the blue dots. This was the best way to keep track of these two cycles. After the first 72 years, you would need to start a new 72 year cycle because the first counter would be busy continuing on until it reached 128 years. The 72 year period had to do with Precession of the Equinoxes, and the 128 years with that missed leap year. 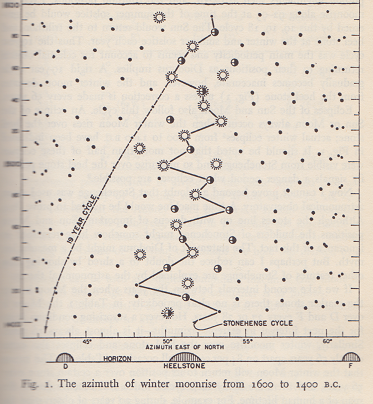 72 years also figured in the orbits of Venus and Jupiter as explained in the original piece. The people who designed this were very efficient. Everything would have worked smooth as clockwork. These were all important cycles in their calendar. The mounds and ditches around the two Station stones were put there to help the counters know where they were in their count. The eclipse cycle count fell on the opposite side of the Station stones from the 72 and 128 year cycles. I have also been reading The White Goddess by Robert Graves. He has many mistakes in that book and apparently admitted to making up the tree alphabet calendar. But one of the things he said may in fact be correct. He said that the ancient Celts had a calendar which had 13 periods of 28 days each, and that the year was 364 days plus 1 day. There are many stories which mention a year and a day, he thought this came from their calendar keeping. The year was 364 days, plus 1 day. When a year is counted on the Aubrey hole circle, you have to go around the circle six and a half times. This gives 364 days or 13 periods of 28 days each. One more day had to be waited for before the year was finished. The calendar at Stonehenge certainly connects to what he said, so I think that was correct. This is the original ancient Celtic calendar, likely home-grown, after all, they had some 4000 years to sort out the astronomy there. Those first posts on the Equinox line were put there 4000 years before the Aubrey hole circle was built. They had it all sorted out, by that time.